Our next co-op night is upon us! 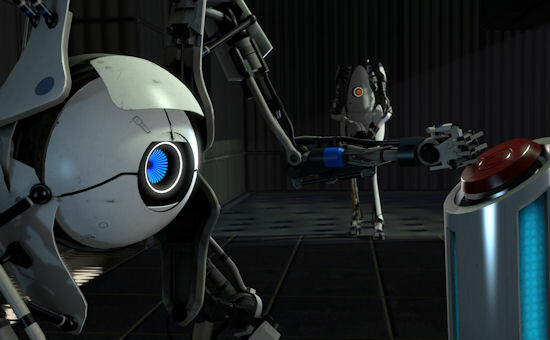 This month we're jumping into Portal 2's cooperative mode - and truly excellent extension of the game's single player story. Players take control of P-Body or Atlus, two Aperature Science testing robots, and run their course through several puzzles that take four portals and plenty of deaths to solve. Want to join up? We're kicking things off at 8PM Eastern on Thursday, April 28th via Xbox Live. Because Portal 2 is only a two player co-op game and that somewhat limits how many games the staff can play - please leave your Gamertag below in the comments section. Doing so will help facilitate games between community members and help you find co-op partners faster. The goal of a co-op night is to get as many people playing a game at the same time as possible so you won't have a hard time finding a partner to play with! If you don't use the list of gamertags below, you can try your luck with the game's built in match making. We may have some prizes to give out later this week, so leaving your tag/name below will enter you to win. Be sure to check back for details on that as well as our full Co-Op Review!